Many thanks to Ann Fontaine for recommending Louise Penny's mysteries. 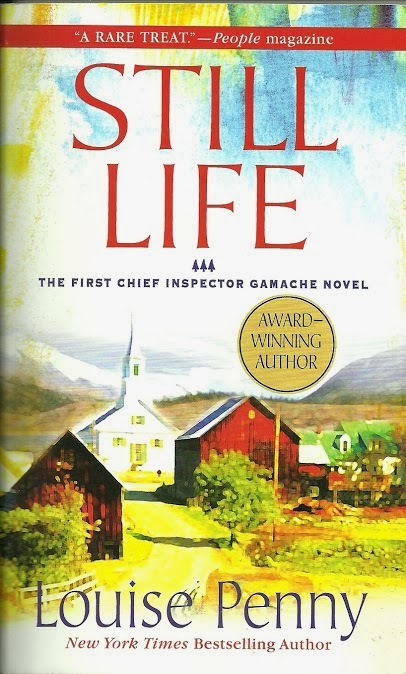 I'm about three quarters through reading "Still Life", the first book in the series with Chief Inspector Gamache of the Sûreté du Québec in Canada. I'm enjoying the story immensely, and I still don't know whodunnit, so no spoilers. The village stirred and by seven-thirty most homes had come to life. Lucy [the deceased's golden retriever] had been let out of the Morrow home and was wandering around, sniffing. She put her nose in the air, then slowly turned and walked then trotted and finally ran to the trail through the woods that would take her home. Back to her mother. Gamache watched the golden-feathered tail disappear into the maple and cherry forest, and felt his heart break. A few minutes later Clara came out and called Lucy. A single forlorn bark was heard and Gamache watched as Clara went into the woods and returned a moment later, followed slowly by Lucy, her head down and her tail still. Gamache suffers from vertigo, and the author describes quite well his panic when he climbs up a tree to a rickety deer stand in the woods. Gamache dug his hands into the bark, feeling the wood pinch his palm, glad for the pain to concentrate on. His horrible fear, and the terrible betrayal, wasn't that he'd trip and fall, or even that the wooden blind would tumble to the ground. It was that he'd throw himself over the edge. That was the horror of vertigo. He felt pulled to the edge and over as if an anchor was attached to his leg. Unaided, unthreatened, he would essentially kill himself. He could see it all happen and the horror of it took his breath away and for a moment he gripped the tree, closed his eyes, and fought to breathe deeply, regularly, from his solar plexus. It worked. Slowly the terror ebbed, the certainty of flinging himself to his own death diminished. Vertigo or acrophobia plagues me, too, and it's not simply loss of balance or dizziness in high places. Panic sometimes takes hold when I'm at the top of a stairway or any height and, like Gamache, I fear flinging myself down from the height. The terror dissipates only if I quickly grab a railing or something solid, or if I back away from the edge. Though I've strayed well away from the subject of the post with my diversion to the description of Gamache's vertigo and reference to my own, the quote is another vivid example of Penny's excellent writing. I highly recommend the Gamache mysteries. Very much so. I didn't think I would discover another mystery writer whose entire works I would want to read. My standards are high. Wait till you get to the one with the chocolate-covered blueberries...and the latest, which owes its title to Leonard Cohen. And I see there is another one about to be released. There's much to look forward to! Enjoy. Later on there will be a story that takes place between two of the books. I'll buy and read the books in the order they were published and then pass them on to a friend whose tastes are similar to mine. I noted the title of the latest is an homage to another Canadian, one my favorite performers. According to Louise Penny's website, the next Gamache "The Long Way Home" will be out August 26th.